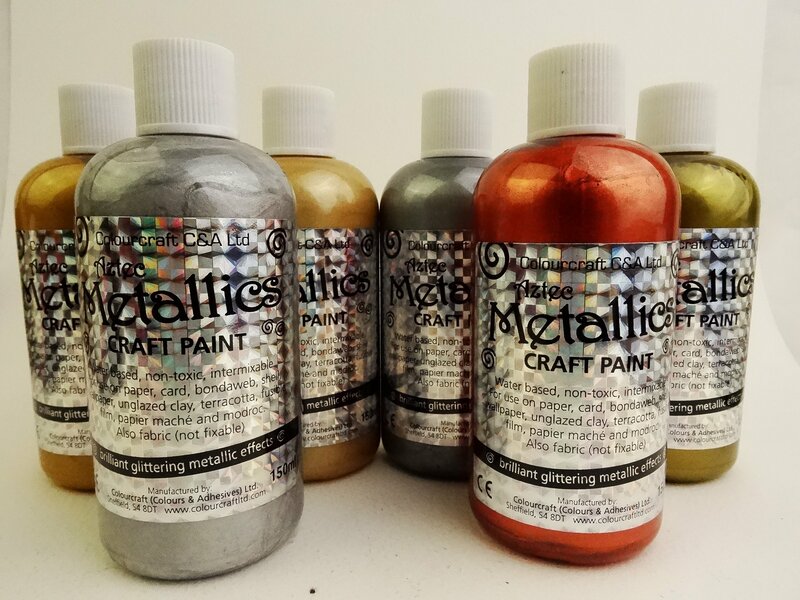 Aztec Eco Metallic Paint Starter Pack - 6 x 150ml **While Stocks Last** | Colourcraft Ltd.
High quality precious metal effect water based paint. Can be applied to porous surfaces to decorate and enhance any project Aztec paints produce outstanding shimmering metallic effects when dry. They are ideal for recreating the look of precious metals, pearls, for art deco and other projects, mask decorations, carnival scenes and stage props. Stunning effects can be created by using this paint with either Bondaweb or Tyvek and heat distressing It can also be mixed with other mediums to create additional effects Non-toxic, light-fast, non-tarnishing, not based on metallic powders Wheat and gluten free, VOC & Oil free. Acid free.